One year I had the pleasure of teaching our Pre-K class. Since these children are bit older, the other teacher and I decided to put on a Christmas program that was a little more involved. The church allowed us to use many of the costumes they had on hand for their Christmas program. Then we has some help from parents, and made a few things ourselves. This program does require some planning and preparation. We had to coordinate some times to p ractice together also. It was work, but it was also beautiful. For the program the children did not have to learn any lines. 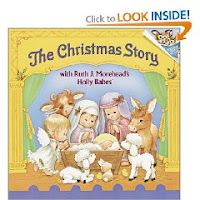 I read the book, "The Christmas Story," with Ruth J. Morehead's Holly Babes. It is a beautiful story of Christmas written so that little children can understand it. I love this story. We gave the children parts in the play. We had Mary, Joseph, Angel Gabriel, an innkeeper, shepherds, three kings, other angels, a donkey, and some animals for the stable. The main costumes came from the church. We mostly had to make some animal decorations. All we did was make headbands with different ears on them. As I read the story the children performed on the stage. Our stage had two entrances so we had children lined up on each side with a parent or teacher with them. We also had someone nonchalantly on stage in case children forgot where to go. By the end of the story all the children are on the stage together. We finish by singing Happy Birthday to Jesus and "We Wish You a Merry Christmas." I loved doing this play, but have been unable to since that time. If you are thinking of trying something out, check out this story, it's easily adaptable and creates a great program.